Fastest qualifier Favorite Motion headlines the Grade 1, $976,750 final at 400 yards on Sunday at Los Alamitos. LOS ALAMITOS, CA—NOVEMBER 3, 2018—After a dominant victory on the night of the Golden State Million Futurity trials, Richard Frandsen's Favorite Motion will look to deliver another big effort when headlines the Grade 1, $976,750 final at 400 yards on Sunday at Los Alamitos. 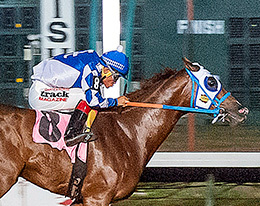 Ridden by Cruz Mendez for trainer Jose Flores, Favorite Motion scored a 3/4 length win in the final trial of the night on the way to posting the fastest qualifying time of :19.70. The Utah bred gelding by Favorite Cartel was picking his second victory from just three starts this year, his other win being an equally impressive 1 1/2 length maiden win on August 24. "I've told people that Decati was fast, but Favorite Motion is faster," said Frandsen while comparing his young star to his older brother. "He’s also a little more muscular than Decati. Their mother (Mia Ta Fame) was 16 hands. She’s long and she throws length on them." Frandsen, who bred and co-owned the Grade 1 stakes placed Decati, is having a blast campaigning Favorite Motion. "I hope Favorite Motion remains sound and we can pick up a few bucks and we can pay a few bills," he added. Favorite Motion will start from post seven in the Golden State Million final. The most impressive runner on trial night was the filly Flash And Roll, who won her heat by two lengths under all-time leading Quarter Horse jockey G.R. Carter for trainer Justin Joiner and owner Scott Bryant. The First Moonflash filly has won three of four career starts with her only loss coming in the $1 million Ruidoso Futurity on June 10. She ran a beautiful winning race in her 440-yard trial to the All American Futurity, but she missed qualifying to the final as the times got faster as the afternoon of racing went on. Flash And Roll will start from post number four. Wicked Affair and Jess Macho Corona, the second and third place finishers, respectively, in the Grade 1 Ed Burke Million Futurity are among the other top contenders in the Golden State final. Owned by Turner Farm for trainer Paul Jones, Jess Macho Corona won his trial by half-length while leading from start to finish. He's won his last two starts at Los Alamitos since returning from a quick one-race visit to Ruidoso Downs. Legacy Ranch’s Wicked Affair won the Grade 2 Robert Adair Kindergarten Futurity on May 20 and was second in the Ed Burke on June 24. That was her last start prior to the Golden State Million trial and could be a lot sharper this time around. Mike Casselman, who trained the winner of the Golden State Million in 2015 and 2016, will saddle the Burns Ranch-duo of Tequila Sangria and You Caught My Eye. Jaime Gomez, who won this race with J Fire Up last year, will send out Cesar Dabdoub's Ali Babe Foose. Governor's Cup Futurity winner Powerful Favorite, Symbol Of Faith, Apollitical Pence will complete this outstanding field.